Schoolwear – our biggest department serving uniforms and personalised uniforms to over 100 hundred schools in and around Berkshire. We supply direct to schools in bulk and cater for unusual sizes. Telephone ordering is available for items that have been forgotten and same day posting where possible. We also arrange to take our uniforms to sell at schools that require this service, thus saving parents endless queuing in the busy departments. We also supply trunks and tuck boxes for the boarder. Rugby shirts, football shirts, socks, shin pads and shorts.We have supplied, personalised rowing blazers to a school in New England in the US of A. Several generations of Berkshire people have had their new uniforms from us and today are bringing their grandchildren here for the same reason. 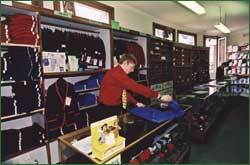 Some of our customers have shopped with us for many years. Uniforms for Rainbows, Brownies, Guides, Beavers, Cubs and Scouts are available all year round with sizes to suit all.